Landry started monkey crawling a few months ago. It originally started when he would crawl over a rug. Then when my parents got their new house with all the brick and tile, he does it all the time *unless he has pants on, then he's fine* I finally got in on camera! There were a lot of hot air balloons in town on Friday for a big shindig at the Canyon and at a local park. I really did want to go see them (I always thought it would be neat to go to Albuquerque to the balloon festival) but between Chris working on the bathroom and Landry needing to go to bed, we didn't make it. So on Saturday morning, Chris called and said there were a lot of balloons out if I wanted to take Landry to see them. By the time I finally found them, they were across town! Yes, I did take this picture while driving. This one was my favorite! In another picture you can see that on the brown part of the bottom of the balloon is an eagle. It was really neat! And I know I give my hubby grief over missing my little car and now driving the tank, but after getting to jump a curb and park in the field where all the balloons landed, I had to thank him! We were literally next to the balloons! I have a whole lot more pictures of all the balloons, but I didn't figure I should put them all on here! 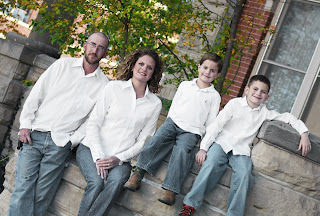 Then on Saturday afternoon, I took my brother and his families pictures! I've been wanting to use my new camera and take actual pictures for someone and I finally got the chance! By the time I got home from picture taking it was time to get ready for Trick or Treating! 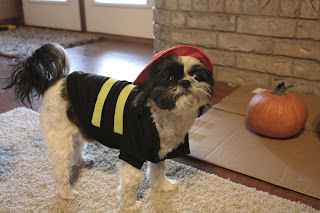 Here's Addi in her fireman costume! Yes, I agree. I'm pretty sure she hates me. But my little dalmation puppy thought she was HILARIOUS! All the boys dressed in their fire gear at Grammy and Grampy's. Doesn't my child looked thrilled? After leaving my parents we visited my grandma, then we joined our friends at Trunk or Treat! And then visited a few of our neighbors. Landry had a great time at his first Halloween! His first birthday party is coming up this weekend! Landry is so cute doing the monkey walk. Glad you saw the hot air balloons in action. It's awesome to watch. 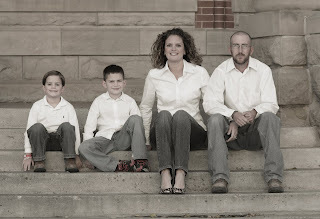 Good pictures too of Terry's family. It was fun seeing my3greatgrandsons coming to trick or treat. They light up my life. Landy is hilarious. Love that monkey walk. I don't know how he can stand to crawl like that...looks painful to me. So cute! Like the new look and new name of your blog. Landry is too cute!!! Josh got a kick out of watching his monkey crawl.